A billion here. A billion there. Soon You’re Talking Real Money. I was looking at the results the other day of a pilot test of Powerhouse Dynamics’ SiteSage Energy and Asset Management system at a restaurant chain, and it got me thinking about the aggregate impact of wasted energy use on the restaurant industry. The 2 restaurants in the pilot reduced their electricity use by 17% and 14% respectively. Let’s call it 15% on average. That is toward the high end of the range we are generally seeing across the hundreds of restaurants we work with – although we believe the savings can potentially grow over time. But let’s go with it. According to a January, 2013 report by The NPD Group, there are approximately 616,000 restaurants in the US. Energy use will vary wildly based on a wide range of factors, including whether the facility is a Quick-Service (QSR) or full service restaurant, its size, number of meals served, climate, and more. I tracked down a July, 2011 report, the Restaurant Energy Use Benchmarking Guideline authored by the National Renewable Energy Lab along with Architectural Energy Corporation. The report looked at hundreds of restaurants of different types, analyzing the impact of multiple factors, and came up with a mean usage of 335,258 kilowatt hours of electricity and 10,943 therms of natural gas per year. (We’ll get past these terms in a second). BTW, the mean restaurant size of the sites studied was 3,266 sq. ft. (The range was 426 to 29,726 square feet; I would love to know what restaurant that was). 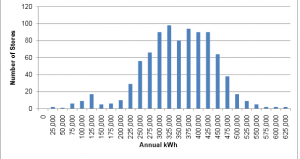 This mean usage of 103 kWh per sq. ft. is very consistent with the numbers that we have been seeing. Now for the fun stuff. Based on these numbers, the restaurant industry in the US uses about 206 billion kilowatt hours of electricity per year. What does that mean? Well, for one, that is enough electricity to power almost 15 million homes. More relevant, it costs the restaurant industry just over $20 billion per year. 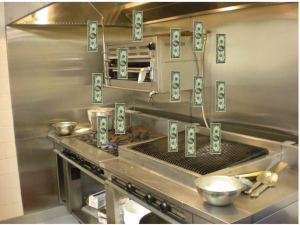 Gas costs are lower, but at an average cost of $1.20 per therm, down significantly from a few years ago, the restaurant industry spends about $6.75 billion per year on gas. If the entire industry could reduce their electricity usage by the 15% level we have been seeing on average, the savings would be on the order of $3 billion per year! That’s with no compromise on quality (or guest comfort for that matter). The percent savings for gas is perhaps half that for electricity, which results in an additional savings potential of $.5 billion. $3.5 billion left on the table: now, that’s real money.